Idaho Snowberry Honey for sale. Buy online at Zingerman's Mail Order. Gourmet Gifts. Food Gifts. Like a garden in bloom. Whoever gave the Snowberry bush its name was a poet, albeit one that courts danger—the berries are poisonous. Luckily bees make honey from the nectar in the flowers, not the fruit, so we’re safe. The tiny pink flowers that cover a snowberry bush last only for a short time in the spring. 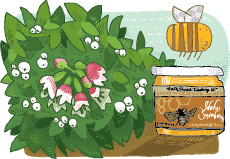 The brief flowering season must concentrate the flowers’ aroma because opening a jar of snowberry honey is like walking into a summer garden in full bloom. This is unlike any honey we have on our shelves. The flavor, after the scent subsides, is buttery, toasty with subtle hints of spice that give way to rich, big butterscotch flavors. The honey is pale yellow and runs thick as syrup.